Northern lights: mostly up north? The Northern Lights – Aurora Borealis – are indeed a unique phenomenon. And about everyone who has seen them will agree on it. When you really catch them in “a good mood” – shifting colours from green-yellow over to red, and even kind of a purple – and see them dance in the sky, albeit bit out of step, it’s a once in a lifetime experience. We, who live here in Iceland, on the 63°- 66° latitude North, are very lucky indeed, because this is an ideal part of the belt in which in the Northern Lights tend to appear. Many guests book their Icelandic holidays consciously during the winter season in order to be able to see this natural phenomenon with their own eyes. What causes the northern Lights are the solar eruptions, also called sun-winds. The solar eruptions emit a big amount of negatively charged ions, which travel out into space, and are directed to the Earth when the eruption is on that part of the sun that faces our planet. In about one and a half day these ions reach the atmosphere of the Earth. Since they are electrically charged, they are pulled towards the magnetic poles. They go towards both the North and the South Poles. But since there are so few people living on the active belt Southern Hemisphere, the Aurora Australis are very rarely seen. In an altitude of 80 – 200 km, this immense quantity of ions manage to create a visible light, with a colour that depends on which atoms in the atmosphere are hit by the ions: Oxygen, Nitrogen or Hydrogen. You can’t expect to see the Northern Lights all the time, even within the active belt of the lights. First of all, there’s no chance to see the lights without the sun winds being active, which they are not all the time, at least not in the intensity which manages to create and emit sufficient amounts of the charged ions. Secondly it has to be dark enough to distinguish. Even though the lights may be glimmering the whole day through, you won’t be able to see them until it is very dark. And here the light pollution also plays a part. For example, it is easier to see the Aurora Borealis from a remote location – like one of our holiday homes – than in a town with a lot of streetlights, and similarly a bright moon high in the sky can obscure the Lights. Therefore, in Iceland, they are only visible in winter, or roughly from late August until early April. Thirdly, the sky must be a clear sky, as the Northern Lights are not visible through the clouds. 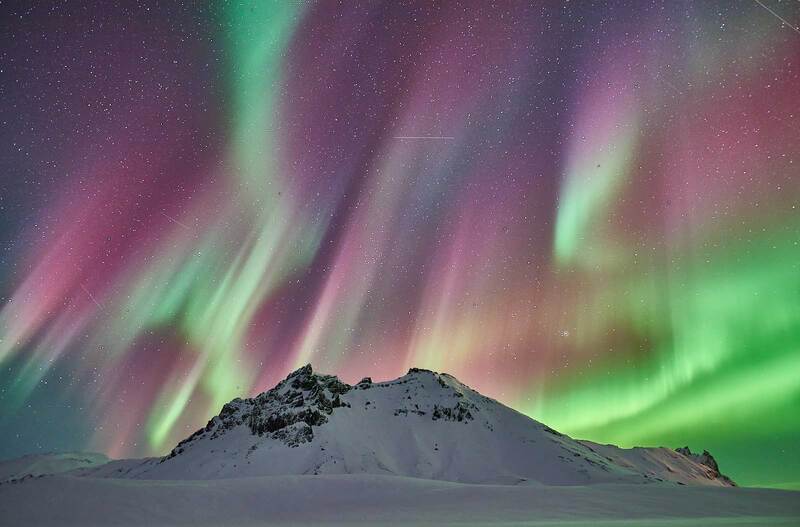 What is decisive to experience aurora borealis? Last but not least, the most important influence on your ability to see the Northern Lights should not be forgotten: yourself! You must stay awake and keep your eyes open during the evening and/or night. Then we have some regularity regarding the fluctuation of the Northern Lights: periodical waves in the intensity of the lights. In a 11 years’ cycle the Northern Lights reach their peak of intensity, and in between the peaks there is the low. The last peak was in 2010 – 2012, and therefore there should be a “low tide” now, in 2017 – 2018. Maybe this regularity has turned into some irregularity, as the lights have been very vivid this winter. Or have they turned into exhibitionists??? Some people would say that it doesn’t matter where you spend your holiday between 63° and 70° latitude. This can be in Southwest Iceland, South Iceland or Northern Iceland. However, there are more parameters that play a role. The weather forecasts in winter in Iceland show in general more southerly wind directions in Iceland, and therefore more clear skies up north, making our holiday rental lodge Hamragil an ideal location to spend your holidays and discover the Northern Lights. While this holiday accommodation is close to Akureyri, the biggest town in Northern Iceland, it is the other side of a mountain from the town and gets none of its light pollution. To give the Lights even more of a chance, turn off all the outdoor lights off. 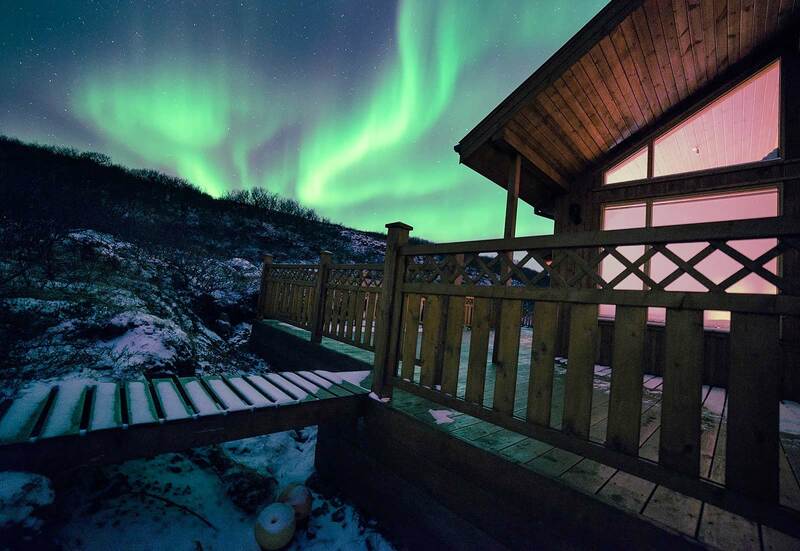 The highlight of your winter holiday in Iceland is to sit in the geothermal hot pot in the dark, which is included in the rent of the holiday house Hamragil and to admire from there the dancing Northern Lights in the sky. During daytime you could explore the natural sights in the vicinity: the Lake Myvatn area, the waterfalls Godafoss and/or Dettifoss, as well as the thriving whale watching town of Husavik. 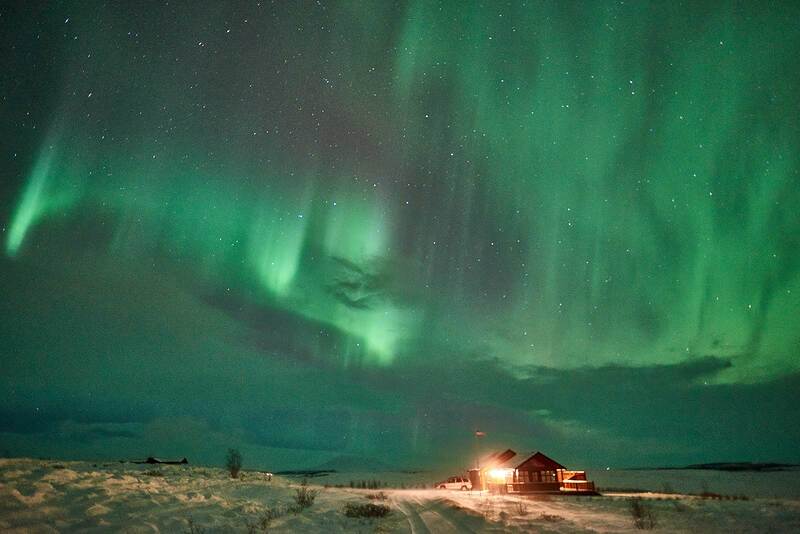 Northern lights this year also increasingly in Southern Iceland? Having said that, this winter we have, until now at least, had the unusual situation of northerly winds prevailing in Iceland for more than a month. Therefore, the south of Iceland has been a very good for viewing the lights. Our guests staying in our vacation cottages Lodge Holt and Lodge Brekka, have in the last weeks crowned their Iceland winter adventure with fantastic sightings of the Aurora Borealis. Lodge Holt is located on the Golden Circle, just south of the nature gems Geysir, Gullfoss and Thingvellir (Þingvellir). You can rent the holiday home Brekka if you want to spend your holiday in the southwest of Iceland. 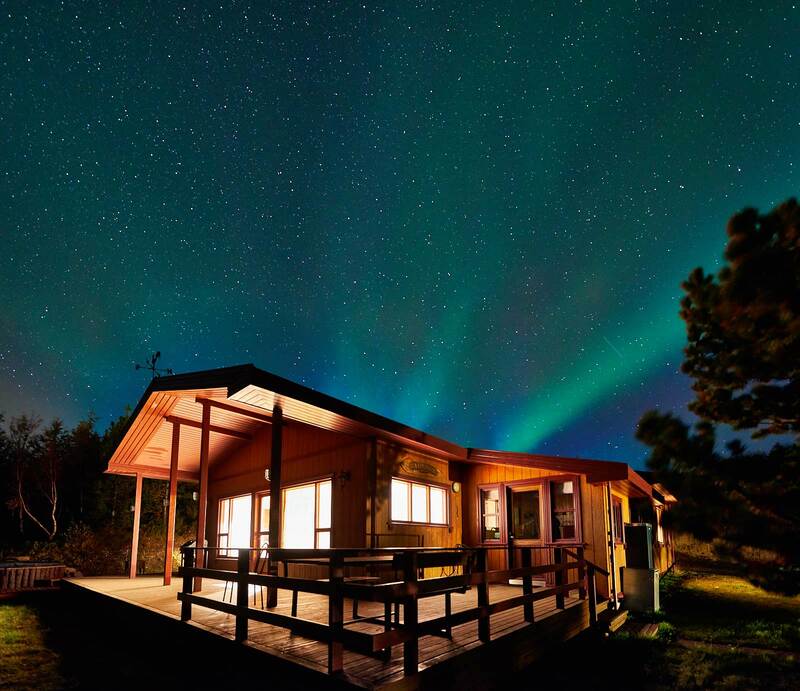 Lodge Brekka is only a 45 min drive north of Reykjavik, but sheltered from its light pollution by Mount Esja. In fact, seeing the Northern Lights mostly depends on a four letter word, which starts by an “L”. No, it’s not Love… it’s Luck!